R.N. Morris was born in Manchester, England, in 1960 and now lives in North London with his wife and two children. He sold his first short story to a teenage girls’ magazine while still a student at Cambridge University, where he read classics. 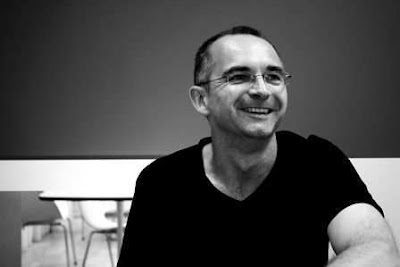 Writing as Roger Morris, his contemporary urban novel Taking Comfort was one of the successes of Macmillan’s “Macmillan New Writing” imprint in 2006 and his first published novel. (Macmillan New Writing was launched in April 2006 with the aim of discovering superb new novelists writing in all genres. It publishes one novel per month and welcomes submissions from unpublished novelists of adult fiction.) His short fiction has been published in a number of mainstream, genre and literary publications. One of his short stories, The Devil's Drum, appeared in the Horror Anthology Darkness Rising and was subsequently made into an opera performed by the Solaris Musical Theatre Company in the Purcell Room on London's South Bank. Another, “Revenants,” was published as a comic book. A Vengeful Longing (2008 Faber and Faber) is the follow-up to his first novel written as R.N. 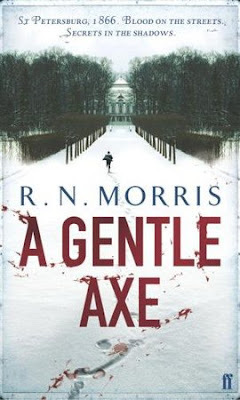 Morris, The Gentle Axe (2007 Faber and Faber / US Penguin). Both belong to his historical crime series in which the central character, Porfiry Petrovich, arose from Dostoevsky’s Crime and Punishment. Tell us how you found out about the Macmillan New Writing scheme and what happened to make your book a success? I found about it through the internet, I think. I was always on the look out for publishers who were interested in new authors. I liked the fact that they were accepting e-submissions, it seemed to make the thing that much more immediate. The book had been to one previous publisher. An editor there had been very enthusiastic and gave the impression that she was about to make an offer on it. But her more conservative colleagues thought it was too much of a risk and so the offer did not materialise. At that point my agent sort of gave up on it, because he knew that I was working on something else that he thought was much more marketable – the book that would become A Gentle Axe. So I decided to sub Taking Comfort myself, and actually at the time I didn’t tell my agent I had done it. By this time, Gentle Axe was finished and he was subbing that. Anyhow I did eventually come clean with him, and soon after I got the email from Mike Barnard of Macmillan New Writing, saying they wanted to publish Taking Comfort. I was delighted. I had been writing for many many years and had lost count of the number of unpublished novels I had under the bed. I had virtually given up hope of ever being published. Soon after, my agent got the offer through from Faber and I was in the slightly embarrassing position of having two publishers. To go back to Taking Comfort, there was a launch party for the Macmillan New Writing imprint, and I met the reader who had pulled my book out of the slush pile. That was a great moment. She took the trouble to find me and congratulate me and say how much she had enjoyed the book. Needless to say, I was extremely grateful to her. Following the contemporary urban writing of Taking Comfort you went back to 19th century St.Petersburg for both ‘A Gentle Axe’ and the second in your series ‘A Vengeful Longing’. Do you think you have now found your home in historical crime or do you have any plans to return to contemporary fiction? I am enjoying writing historical novels and I am amazed at how well they have been received so far. So maybe it is my niche. But really the whole thing came about because I had an idea for a book – to write a detective novel with Porfiry Petrovich, the detective from Crime and Punishment, as the central character. I then had to become a historical novelist to write the book that came from that idea, so I was learning the ropes as I went along. Having said that, I had attempted similar things in some of my unpublished novels. One was purely historical, no crime. Another was a different period, different setting and slightly more surreal storyline! Perhaps the way to look on those unpublished novels is as apprentice pieces. I wouldn’t like to think that I can only write historical crime now. I have other ideas for books I would like to do, though most of my ideas are historical, I think. I find it very difficult to think about writing about the contemporary world. As soon as you start writing about it, what you are writing becomes dated. I imagine that Taking Comfort, written in 2005, has the feel of a different time to it now. The Times wrote in a review” As forensic science has come to dominate the real world of murder investigation, crime writers are increasingly turning to moments in history when detectives had to do without fingerprints and DNA.” Do you think that affected your choice of setting and time period or what drew you to Russia and that era? I think there is definitely something in this. I couldn’t begin to write a contemporary crime novel. For one thing, the science dominates to a degree that is not only bewildering for me, but also does not interest me that much. Also the idea of the classic detective who solves mysteries by the power of his intellect or his psychological insights just isn’t appropriate in that setting. Everything seems to be solved by DNA, or fibre samples, or the dust from some obscure seed pod only found in one area of the Arizona Desert. I’m not sure forensic investigators can do everything that they are represented as doing on CSI, and I certainly don’t believe they have those whizzy graphics on their computers. But people these days seem to think that they can do anything, and really, where’s the fun in that? I can’t imagine how you would structure a modern detective story. It’s all about waiting for the results from the lab. Once you have it, you go and arrest your man. As for the period and setting of my books, that really came from the idea. Everything started with this mad idea, to write a detective novel that had Porfiry Petrovich from Crime and Punishment as the protagonist. I was the victim of my ideas – and not for the first time. Were you afraid of potential negative feedback at “borrowing” a classical character, Dostoevsky’s Porfiry Petrovich? What has been your actual experience/feedback so far? Yes, I was. This was something that gave me a great deal of anxiety and there were a couple of reviews from purists who basically took the ‘how dare he?’ and ‘he’s no Dostoevsky’ approach. That was expected, so I was able to deal with it. The Kirkus review of Gentle Axe was particularly sniffy. But what worried me more was that it included a spoiler – I got very worked up about that! A South African journalist wrote an article accusing me of a version of identity theft, based on the fact that my acknowledgement to Dostoevsky came at the back of the book, rather than the front, so the reader didn’t know before hand that I had taken the character from someone else. They didn’t know that I had put the acknowledgements at the front in my manuscript and it had been moved to the back by the publisher. Anyhow, there were far more people who were positive about the whole thing, including many fans of Crime and Punishment. One reviewer said that Axe was a ‘worthy successor to one of the greatest novels ever written’, which thrilled me enormously, as you can imagine. Anyhow, I’m more relaxed about it now, and reviewers seem to be too. The Kirkus review for A Vengeful Longing must have been by a different person, because it was totally positive and even spoke highly of Gentle Axe, so it shows how subjective all these things are. Did you deliberately bring in Virginsky as a role, like Lewis to Inspector Morse, or why is his character important to you and the novels? Well, I’m not sure how deliberately I do anything as I usually write by my instincts, and if I do something like this I can only ever say I did it because I had the idea to do it and it felt right. In retrospect, it seems to work well, and it is definitely something readers have responded to favourably. It seems to allow Porfiry’s character to develop, because he has a foil to work against. I would also say that Virginsky does have some kind of role in the books in terms of dramatising some of the political and intellectual issues of the time. He represents the youthful generation, in opposition to Porfiry’s older generation. He’s young, idealistic, impatient – and yet I think he learns from Porfiry, and begrudgingly admires him. As the series develops, the tensions between the two men will come out more, but in A Vengeful Longing, he is very much in the junior role, learning from Porfiry, and questioning him too. The challenge of having this young man working with him keeps Porfiry on his toes, I think. It often seems publishers want more of the same after an author is initially successful, but authors and readers may need something new. Some crime writers I enjoy wax and wane as time goes on with a single character - Cornwell’s Scarpetta springs to mind - whilst others continue to enthrall and support good plot lines but finally need to retire - Mankell’s Wallander or Rankin’s Rebus for example. What will become of Porfiry Petrovich - do you already have his career mapped out? My initial plan was to write four Porfiry books, one for each season of the year – though they are not set in the same year. I’ve now written three – with the final edits just being sorted out for the third. If Faber want me to write the fourth, then I would love to do it. I have the storyline and I think it could be quite a good finale to the quartet. I really don’t know what will happen beyond that. I personally would like to write something different, maybe something nearly contemporary, though not quite. I might go as modern as the 1960s. I was born in 1960, so that would be interesting. I do have ideas for several stand-alone books. You have just completed a first draft of the third Porfiry series, A Razor Wrapped in Silk. Can you tell us something about that? A Razor Wrapped in Silk is set in autumn, again in St Petersburg, a few years on from A Vengeful Longing. There are basically two story strands, one to do with the industrial workers in the city, in particular child labourers; the other is focused on more aristocratic circles. It explores the different attitudes to the murders of people from these very polarised sectors of society. The Tsar makes an appearance in the book, which is something slightly different for me, because neither of the other two had any actual historical personages in them. People who have read it – my agent, my wife and my editor – seem to like it best of the three. Mainly, I think, because the character of Porfiry is developing even more, as is the relationship between Porfiry and Virginsky. As with the others, it is quite a dark book, though there is also a lot of humour in it. The humour is one of the reasons my readers so far have enjoyed it. It’s weird writing books. You spend all this time on your own, working in isolation, not really knowing whether what you’re doing is any good, or even works. There’s a lot of anxiety and trepidation involved in handing it over to someone else to read, but then again the book is only really complete when someone has read it. A Vengeful Longing made the 2008 CWA Duncan Lawrie Dagger shortlist. How did that come about and what did it mean for you? It came totally out of the blue. I think what happens is that your publisher enters books for these competitions but then it’s really in the lap of the judges. I was lucky because there was obviously someone on last year’s judging panel who liked my book enough to shortlist it. A different set of judges might have picked a different set of books. I was asked by one of the judges what it meant for me to be shortlisted and I replied at the time that it reassured me that I was not totally wasting my time. It’s a validation, really. Do you think that literary crime fiction is a distinct genre apart from commercial crime fiction? Do you think you get a different response from critics and journalists because it seems an above-averagely educated work of crime fiction? It’s difficult for me to answer this, to be honest because I never set out to write a deliberately ‘literary’ crime novel. Having said that I have to accept that the literary connection in my books – that they are drawn from Dostoevsky’s Crime and Punishment – did push me in a certain direction, a perhaps literary direction. The truth is, though, that I just set out to tell the story in the best way I could, and in a way that was appropriate to the theme and setting. I did have a meeting with an editor at a more mainstream crime publisher and basically she told me that she would be interested in Gentle Axe if I ‘dumbed it down’ – that was actually the phrase she used, and to be honest, it shocked me. Possibly there is a distinction between literary and commercial crime fiction, though to be honest I like to think of myself as a storyteller first and foremost. It’s just that I also believe that style is also a part of storytelling – that you can contribute to mood and scene – and of course drama - by the actual way you write something. The writer’s first responsibility is to keep the reader reading. And, as a reader, bad prose style is one of those things that stops me reading, so I do try to attend to that. As for the responses from critics and journalists, I think I have done pretty well there. Whether that was because of the perceived ‘literariness’ of the books, I can’t really comment. Part Two of Roger's interview continues here, in which he talks about starting his writing career, his belief in the power of online presence and what he would take with him, on Desert Island Discs. Visit Roger's blog / website here. And the MySpace site for his first Porfiry Petrovich novel. Macmillan New Writing, which many sceptics did not expect to last long, reaches its third birthday in April. MNW pays no advances, and pays a standard royalty based on 20% of the publisher's receipts. Submission guidelines here. This interview is in May's printed edition of the magazine here.